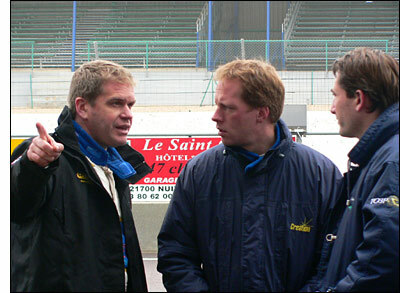 www.endurance-info.com carried the story first – which surprised Team LNT Commercial Director Richard Dean (with its immediacy) this morning – and the news is that the French team Red Racing has agreed to purchase one of the 2006 Team LNT Panoz Esperantes. The sale of three other cars by LNT has already been agreed – details to come – and with Esperantes on Team LNT’s own stand, on the Pirelli stand and the K&N Filetrs stand at the NEC, it wouldn’t be a surprise to find more cars ‘heading out of the door’ in the New Year. Team owner Jacques Fournier-Laroque confirms on the www.endurance-info.com website that Red Racing is targeting the Le Mans Series next year, and expects to be testing the car in March, in good time for the Test Days at Paul Ricard at the end of that month. Regular drivers Romain Brandela and Thierry Stepec (pictured on the right with JC-W in march of this year) will be joined by a third driver for the 1000 Km races, but the regular Red pair will also be tackling the FFSA GT series. The aim in the domestic series is the GT2 title, while the Le Mans Series will see the team learning its endurance trade, with the aim of racing at Le Mans in three years’ time.